The first thing that Clare Mount did was to disabuse us of the idea that she was to give a talk about a monastery. Just because it was called Gorton Monastery didn’t mean that it was a monastery. No. It was a parish church and a friary but never a monastery. Whatever gave us that idea? We were not alone in our misapprehension. When seven Belgians arrived in 1861 dressed in brown robes it was assumed by the locals that they were monks and the Belgians didn’t have enough command of English to correct them. In fact these eight strangers were Franciscan friars. Although members of a religious order, friars differ from monks in that they often take a vow of poverty and are involved in the community whereas monks tend to lead more insular, contemplative lives. The money was raised and the church built, largely by the friars themselves with one of the brothers acting as clerk of works. Once built the friary, as well as accommodating the resident friars, trained new priests and was a base for missionary work around the country. 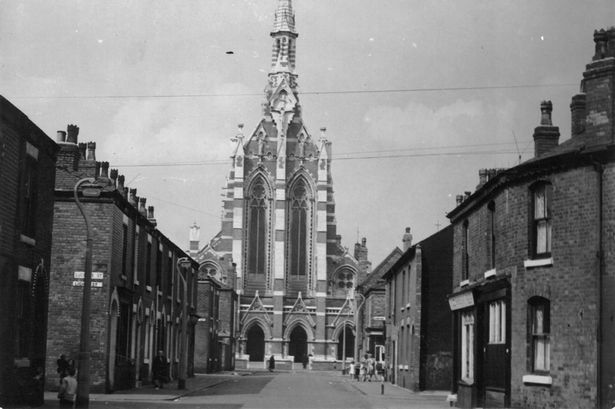 The church, meanwhile, quickly became a hub for the community, with three schools, a community centre and a plethora of clubs, bands and interest groups in its heyday. The area gradually changed, and not for the better. Many of the local industries went into decline, either because they failed to move with the times or just finding cheaper locations elsewhere. This was followed by large-scale slum clearances and the population dispersed to satellite estates around Manchester. Although the building was granted Grade II status in 1963, later upgraded to Grade II*, it had lost its raison d’être. With the congregation depleted, it closed for worship in 1989. The rich decorations were sold or disposed of and the building aqcqired by a property developer. At first it seemed that it would receive a new lease of life. Ambitious plans were shown creating prestige apartments in the building whilst preserving many of its features. Unfortunately it was not to be. The developer was made bankrupt and he disappeared with many of the deposits after selling off whatever artefacts could be removed from the church. It rapidly deteriorated and vandals accelerated the process. Fortunately, before the process went too far, a local businessman who had known the church as a boy, determined to save it. Paul Griffiths and his wife Elaine formed a trust in 1996 and Elaine gave up her job to raise money. A lot of money would be needed and they approached the Heritage Lottery Fund. The first idea - to return the monastery to being a community hub - was rejected as being impractical. The second idea - to develop in partnership with a hotel group - was rejected as too commercial. Eventually a third idea - a community centre linked with an events venue - was deemed to be viable. With a lottery grant plus funds from a variety of other sources, the centre opened in 2007 with a visit from Prince Charles. An ongoing project has been to locate and, if possible, reclaim some of the artefacts from the church. Many have been lost without trace – the 14 paintings marking the Stations of the Cross are a particular loss. However, a large replica of the Crucifixion was saved before it went to a church in Florida and, more recently, twelve statues representing twelve Catholic saints were identified and reclaimed. These were particularly significant as each statue had a unique pedestal on the walls of the nave surrounded by appropriate symbols and flora. Because o f the north-south axis of the church, the sun lights each of these statues in either the morning or the evening. The statues had been identified by a local campaigner and reclaimed for the city by Manchester City Council. They were eventually fully restored by the Trust and reinstated to their original places high in the Great Nave in May 2012. One of the attractions on Open Days is a large replica of the labyrinth from Chartres Cathedral (painted on canvas). One of the Trust’s plans for the final phase of development at the Monastery is to create a permanent stone labyrinth in the grounds. The charity is now largely self-financing as the event venue is well established. It had a visit from the queen in 2013 and, with help from generous local donations and the heritage Lottery Fund, has almost completed a new "Welcome Wing" with facilities for education and the community. It is open to the public on most Sundays and Mondays, 12-4pm, unless a private event is taking place. With this it has now come full circle; a church built for the community, fell upon hard times, but now, 150 years later, is serving the community once more. Editors Note: A labyrinth has one pathway that leads inexorably from the entrance to the goal by a complex circuitous route. A maze has a choice of pathways. 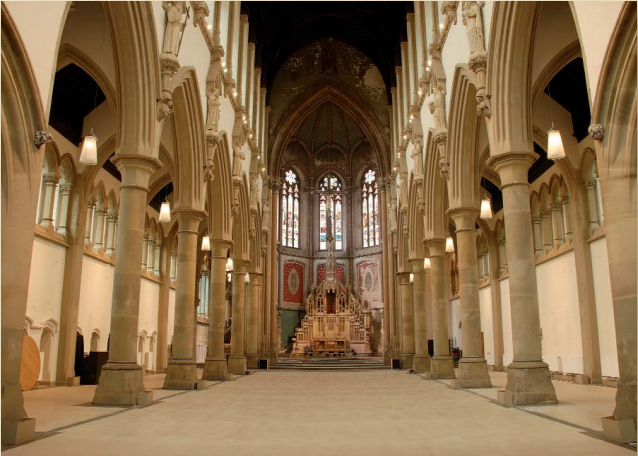 Elaine Griffiths, MBE talks to Visit Manchester's MCR9 magazine about the restoration of The Monastery in Gorton, spearheaded by herself and her husband Paul, a former Altar Boy at The Monastery.